From Kreinik comes a wonderful silk thread called Silk Serica, a 3-ply, 100% pure filament silk with a magnificent, rich sheen. 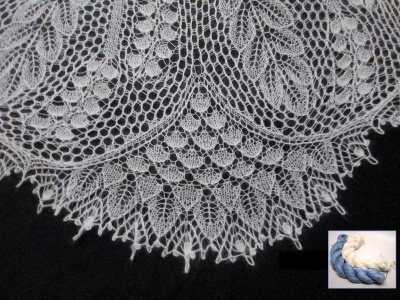 It is a versatile silk thread that can be used singly as a fine twisted silk, or it can be separated for use as a highly reflective flat silk for more advanced stitching techniques (like Japanese embroidery, canvas work, laid work). The color and sheen is fabulous and the hand as one works with it is extremely pleasing. Available on 10 meter (11 yard) spools. 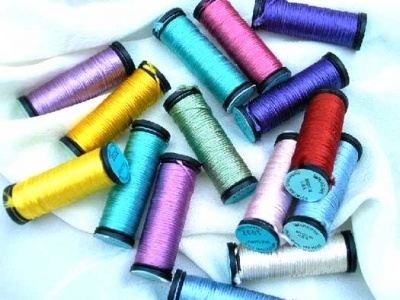 The only reservation I have on this great thread is that should it get wet, this silk thread tends to stretch. So lovely as they feel, I would not recommend them for a bracelet, unless you are very careful when washing hands. We have a variety of colors and can offer the spools in general color families -- if you need an exact match, please send us the specifications.